Description: Amsterdam, Martines Gastman /P. Joling Oz & Comp for vol.2 1840, 1836 . Two volumes plum cloth spined marbled boards (edges rubbed/spine cloth sunned & head/tail of spine a bit frayed with short tear (1cm). Half title +title +[iii]-x +281pp; Half title to vol.2 + title +294pp. 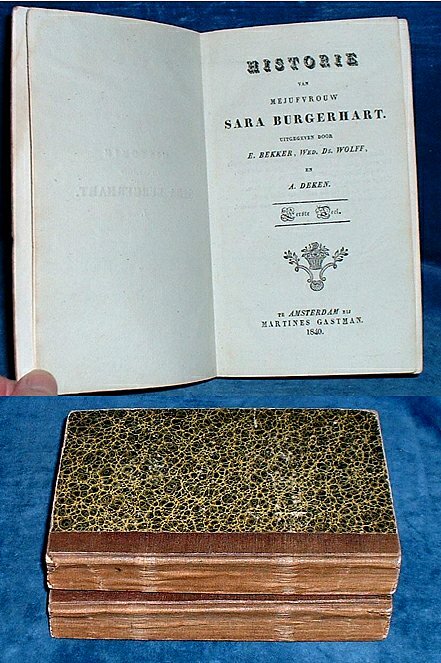 *A novel in letters (and conversations) first published in 1782 with this being a later set, neat and tight with pretty vignette to each titlepage & dividing decorated lines between each of the 175 letters. There is a rough translation of this work on the internet. A Neat printing on laid paper THIS IS NOT A MODERN FACSIMILE.